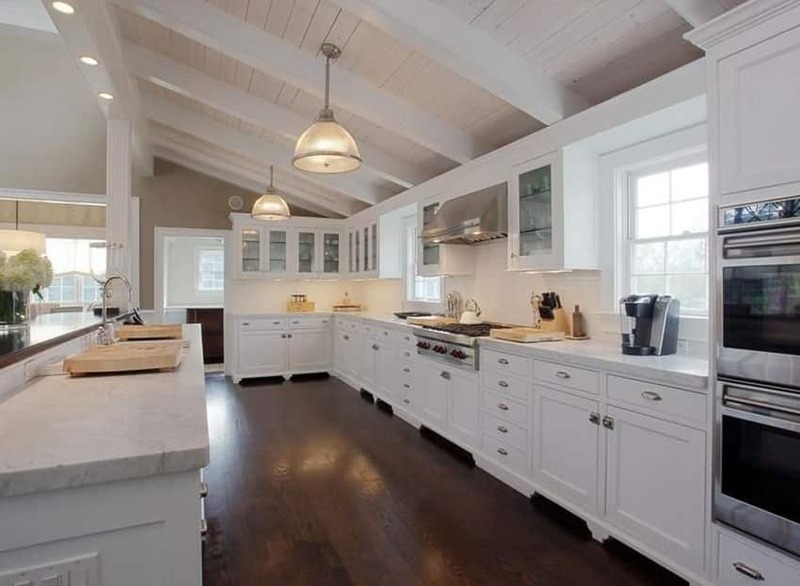 Welcome to out gallery of beautiful white contemporary kitchen designs. If you want your kitchen to be a timeless piece in your home, a space which will never go out of style and would work well with whatever style of interiors or architecture you currently have, then white contemporary kitchens could be what you are looking for. What is a “contemporary kitchen” anyway? Contemporary is such an umbrella term, that one might get confused sometimes, but to make it easy, a contemporary kitchen is basically the current style of kitchens with currently popular materials, finishes and styles. 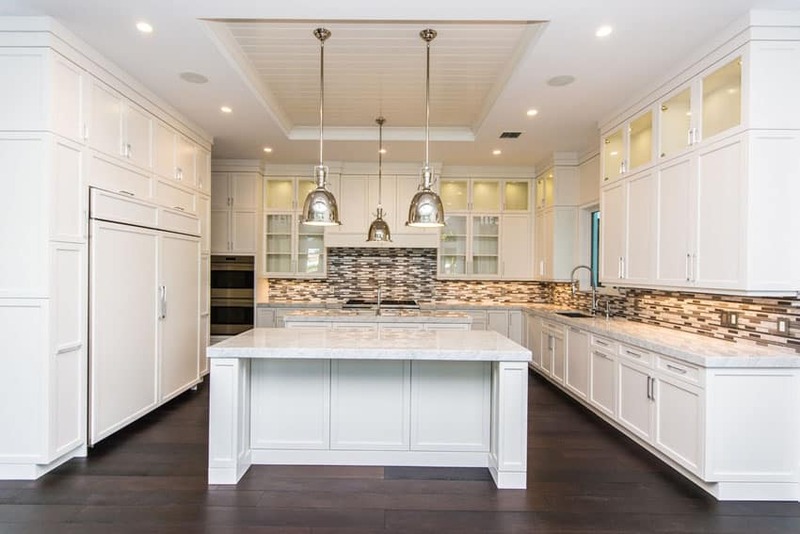 This gorgeous contemporary kitchen in the picture above features all-white paneled kitchen cabinets and a large kitchen island with a Mahogany wood base. The kitchen maximizes the floor to ceiling height to provide lots of storage. 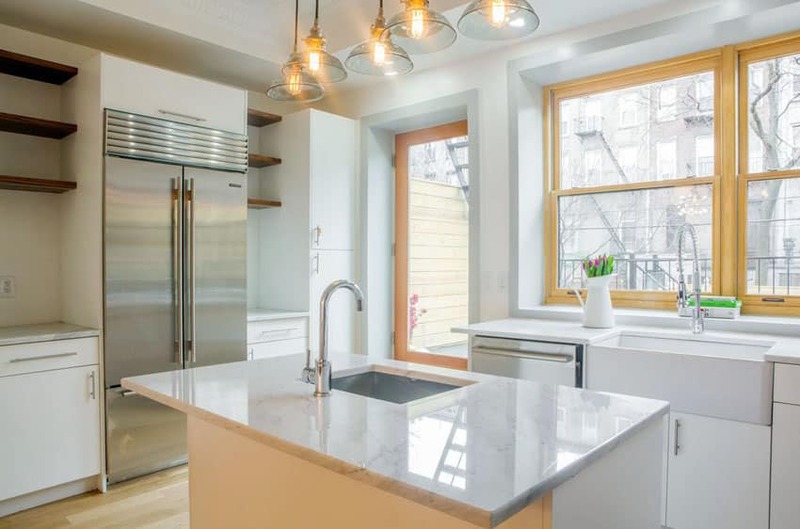 For the counters, marble is used for both the kitchen island and the kitchen cabinets, while white subway tiles were used on the backsplash. There are also upholstered bar stools placed on the kitchen island, and a small round dining area on the side which has mahogany table and black peacock chairs. Contemporary Kitchen Colors – to be able to achieve a timeless appeal, colors used in contemporary kitchens are usually light, neutral colors, so that it could easily match with whatever color you use on your loose furniture pieces, walls, floors and other elements. Contemporary Kitchen Cabinets – they will typically have simple forms or silhouettes, with straight lines and little to no ornamentation. While plain cabinet doors are common, panel cabinet doors inspired by classic kitchens can also be used, but using a simpler molding profile that would not overwhelm the space. Stainless steel grabs, knobs and pulls are common, but there are also designs with push-to-open feature, or a concealed grab feature for a cleaner look. You can see our latest gallery of contemporary kitchen cabinets here. Contemporary Kitchen Island – usually, the design of the kitchen would match the rest of the cabinetry, but at times, it would also use a different color, material or finish, to add contrast and emphasis. Most contemporary kitchen islands are multi-purpose, serving as a dining/bar area, food preparation, and would sometimes have built-in equipment in place. The cabinet base will be, of course, utilized for additional storage space. 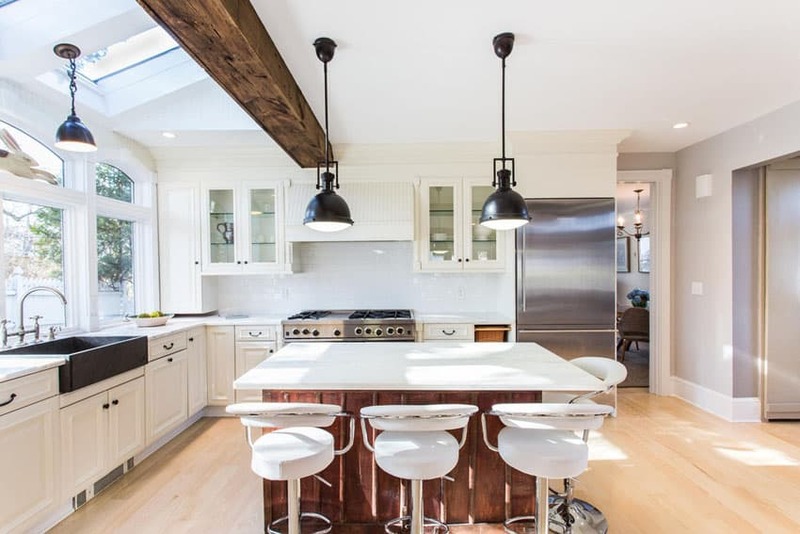 Contemporary Kitchen Lighting – lighting is an important factor in any design, and as for contemporary kitchen designs, lots of natural light is favoured, combined with bright white artificial lighting. Modern accent drop lights and chandeliers can also be used, and even classic lighting fixtures would work, but the general light color preferred is a clean white, using warm white lights sparingly, or mostly for accent. 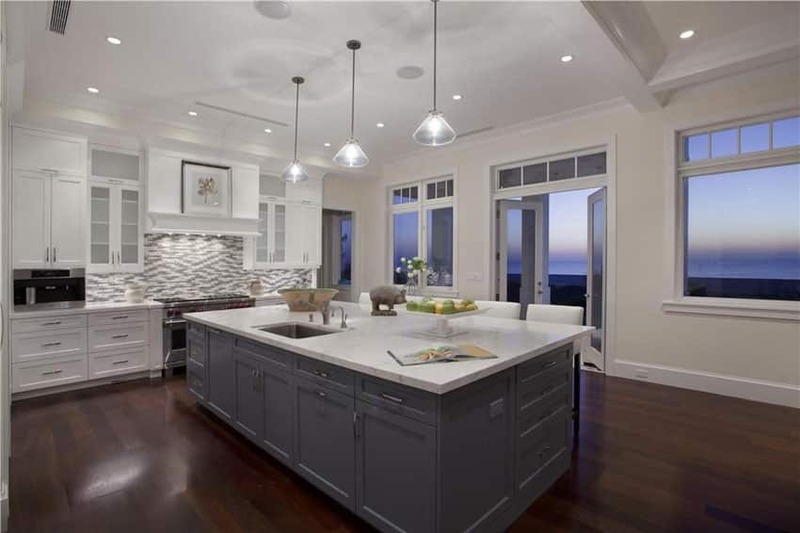 Undercabinet lighting is also common, but not a necessity, although it would help you see better when cooking at night. Contemporary Kitchen Backsplash – there are many types, finishes and materials to choose from when it comes to backsplash. For a clean & simple look, using the same material as the countertop would create a seamless finish, while using a back-painted glass creates a very sleek & modern look. Textures can also be added to the backsplash area, so mosaic tiles, glass tiles, Moroccan tiles and subway tiles are popularly used. It is in the backsplash where we can have a bit of fun with the colors, patterns and textures, as it can easily be changed. Contemporary Kitchen Décor – contemporary kitchens are typically very utilitarian, but there are many ways you can decorate your kitchen without looking gaudy or overboard. Open shelf displays of kitchen pots and china is a good choice for functional decoration, as well as adding wooden butcher’s blocks, and racks for spices. You can also mix and match different colors and textures to loose furniture pieces such as barstools to add a little more personality to the space. Always make sure that the decoration you place in your design is not only ornamental – a functional decoration would always be preferred. This kitchen has a more casual and laid-back feel to it. The kitchen features a sloped ceiling with skylight to provide sufficient indoor illumination. 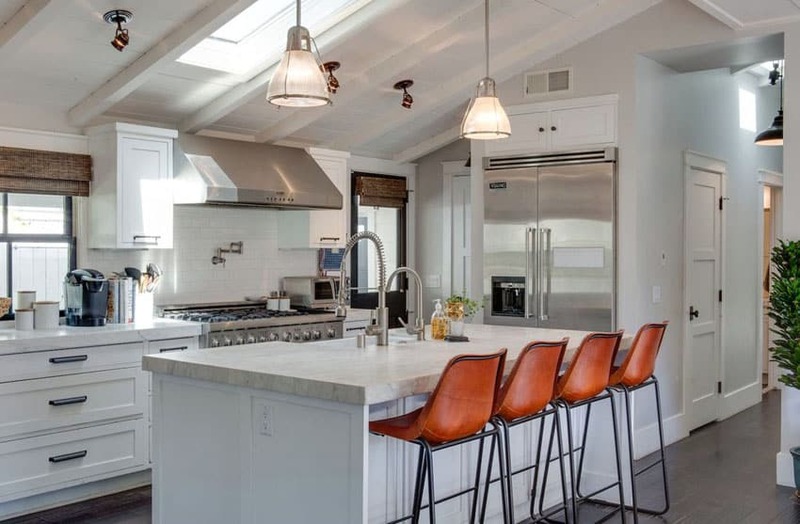 Kitchen cabinets are all-white and topped with gorgeous carrara marble for added elegance, while the modern bent plastic barstools in rust color gives it a more casual appeal. This design is a great idea if incorporating modern contemporary kitchen designs and a more traditional style of architecture. The minimalist high-gloss cabinets seamlessly blends into the classic cornice, creating an interesting blend of styles. The base cabinets on the other hand, uses a combination of stainless steel upper drawers and high-gloss laminates for the rest of its body. The small kitchen island matches the main cabinets and has three classic barstools to match. Since this kitchen has an open floor plan, the dining area can be seen right by the kitchen, and is also seen combining traditional style with modern accessories. Contemporary kitchens usually use modular kitchen cabinets to ensure efficient use of space and a clean and seamless cabinet installation. This example shows traditional style modular cabinets. 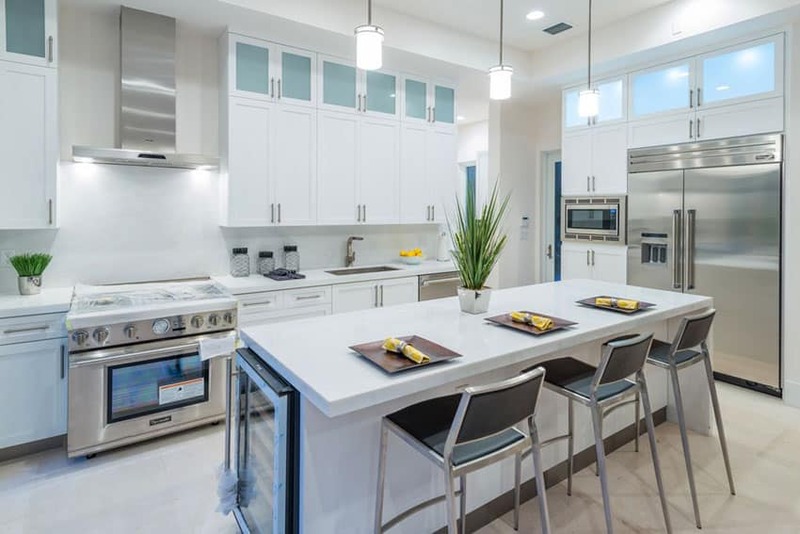 It has an all-white finish, with black granite countertop paired with marble backsplash tiles of a modern yet classic appeal. Since the area is quite small, one wall was maximized for pantry storage, while the kitchen island is narrower than usual kitchen islands to save space and give a more open feel. The flooring in this kitchen is quite dark, but it is balanced out by the soft cream color of the walls and the all-white kitchen cabinets. The simple modular cabinets gives a clean and modern look to the kitchen, while giving it an elegant appeal. The countertop used is gray quartz to match with the gray mosaic used on the backsplash. 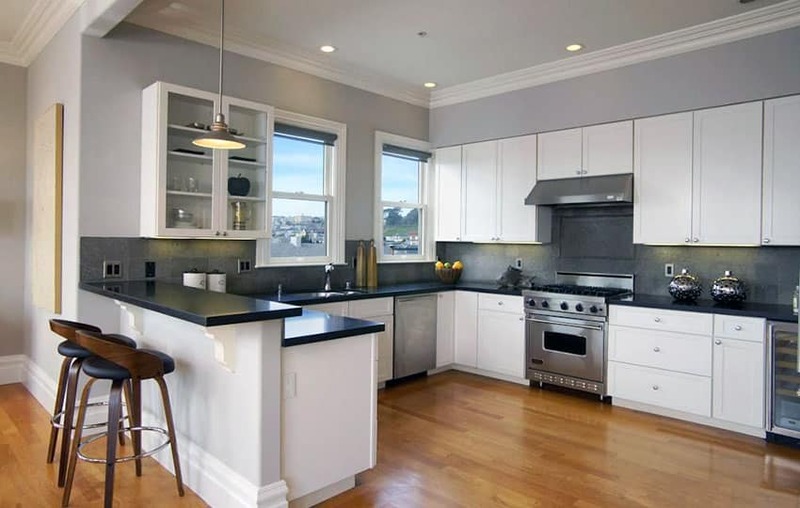 This spacious kitchen uses a combination of classic style modular cabinets and modern loose furniture pieces. The paneled cabinets gives it the classic look, and stands out well from the dark walnut flooring. It uses gorgeous slabs of marble with a soft gray and yellow-gold vein coloring to add a touch of warmth to the surface. 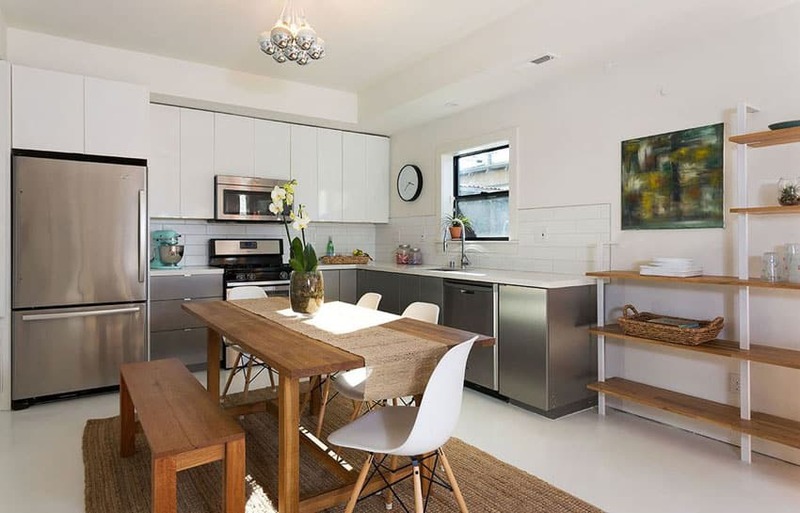 The large kitchen island is paired with 3 modern white leather barstools with stainless steel legs, as well as modern accent lights for a more contemporary feel. Minimalist architecture combined with modern minimalist kitchen design results in a very light and clean look that looks very easy on the eyes and still evoke an elegant feel. It uses very design for its modular cabinets and has a matte white finish to complement the pine flooring and white walls. It also uses white carrara marble with straight nosing for a streamlined look. Instead of using overhead cabinets, it uses walnut finish open shelves instead, to give it a lighter and more casual feel. 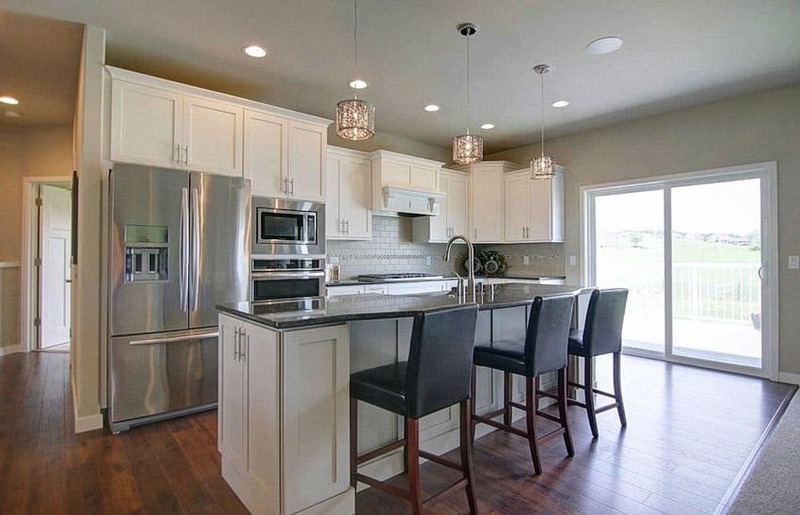 This spacious full-sized kitchen definitely maximizes the large floor area for both storage space and working space. One full wall was dedicated for pantry storage and a concealed fridge, and the overhead cabinets also fully utilizes the ceiling height. Aside from that it also has two kitchen islands, allowing multiple users to work in the kitchen efficiently simultaneously. The all-white kitchen cabinets combined with marble counters gives it a simple elegant feel, with a contemporary silhouette. Despite being limited in space, this contemporary kitchen was able to fit in kitchen essentials and create an efficient traffic flow in the design. The gorgeous kitchen features a black accent wall and pine wood floors, creating a stunning contrast. Modular kitchen cabinets are all in white, with overhead cabinets combining both glass doors and normal panel doors. For the countertop, it uses two different materials for the two counters – one uses carrara marble for both backsplash and the countertop, while the L-shape counter uses solid concrete countertop paired with beige slate tiles for the backsplash. This gorgeous contemporary kitchen adds spice to this clean look by adding a touch of natural wood finishes to give it a very subtle rustic country feel. Maple wood floors, white walls and large windows gives us a very light background, and couple with the high ceiling, creates a very gorgeous ambiance to the space. The classic style modular cabinets has a creamy off-white finish, giving a little contrast against the flat white walls and ceiling. It also has a decorative wood beam on the ceiling in dark walnut finish and an antique mahogany base cabinet for its large kitchen island, adding a more raw, rustic texture to the space, without overwhelming the clean look of the other elements. The small space allotted for the kitchen was efficiently used in this design. The white contemporary modular cabinets with a paneled design goes well with the interior architectural style of the space. The kitchen counters is topped with black granite to give a contrast against the white cabinets and to match the color of the leather barstools. The subway tiles on the backsplash, on the other hand, has a soft taupe color, adding a subtle warm tone to the surface. This kitchen is a gorgeous contemporary interpretation of classic French style kitchens, making use of classic silhouettes combined with modern finishes and materials. Solid oak wood floors and light gray walls provide an lovely background for the kitchen, and helps emphasize the other finishes used. TAll cabinets are made from white-painted wood for a bright and clean ambiance. The main counters uses black granite for the countertop, while the large square kitchen island uses white marble for a more classic feel. The backsplash tiles has a subtle cream & white color combination with Moroccan quatrefoil pattern, matching the pattern used on the lamp above the dining table. The clean, all-white color scheme of this transitional style kitchen contrasts well with the dark walnut flooring of the kitchen. Walls were maximized and installed with floor-to-ceiling cabinets and storage pieces. The large floor area also allowed the use of two kitchen islands – one installed with a sink, and another one a plain table, which can be used as additional preparation area. 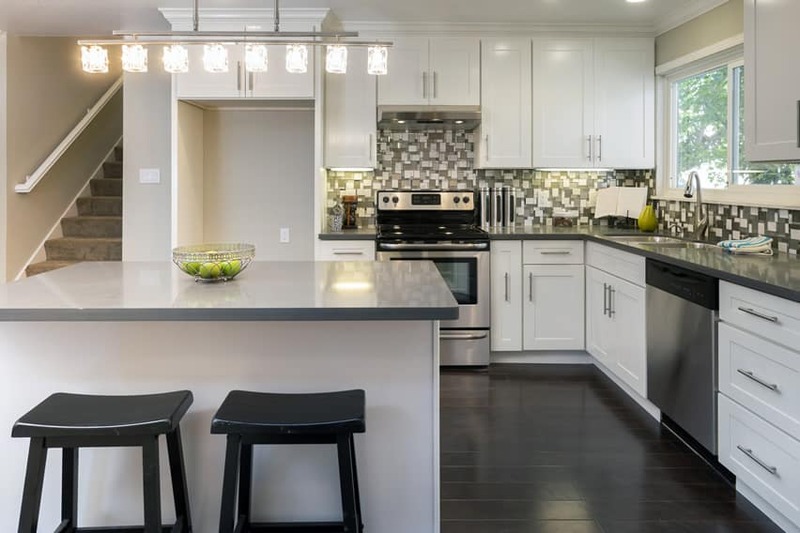 To give it a more modern feel, the countertops uses a straight edge nosing, and is combined with modern lighting fixtures, as well as stainless steel kitchen fixtures. 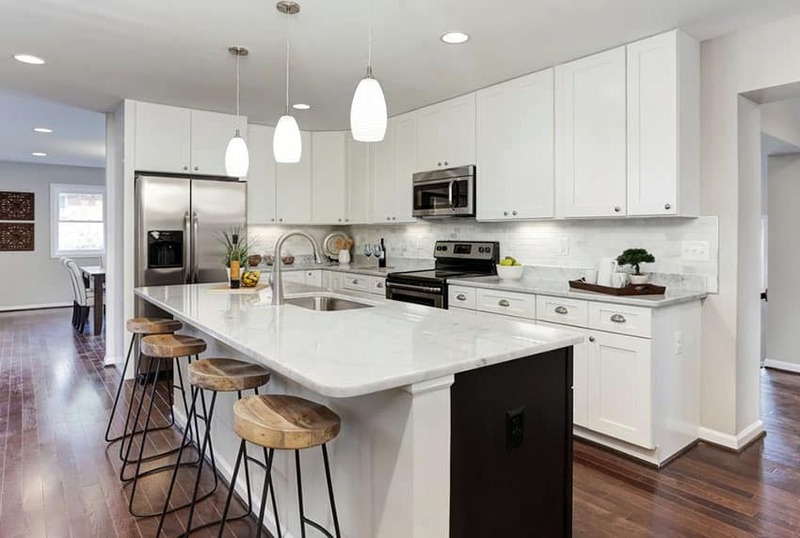 All white contemporary kitchen designs with white marble countertops can benefit from darker flooring or back splash to add some contrast to the space. Another great example of a contemporary kitchen this also features an all-white color scheme for the kitchen. Walls, floor and ceiling are all in white, as well as the modular cabinets. Straight edges of the marble countertops gives it a sleek, modern vibe, while the simple paneled design of the kitchen cabinets adds a sophisticated feel to the cabinets. Subtle variety and textures helps make this contemporary kitchen design more interesting. Light taupe walls and walnut floors provide a soft neutral background to the white cabinetry, while the stone backsplash tiles and mosaic tiles, combined with the quartz counters, adds subtle patterns/textures to the surface. The kitchen island also features a dark mocha laminated base, making it stand out from the rest of the cabinets. 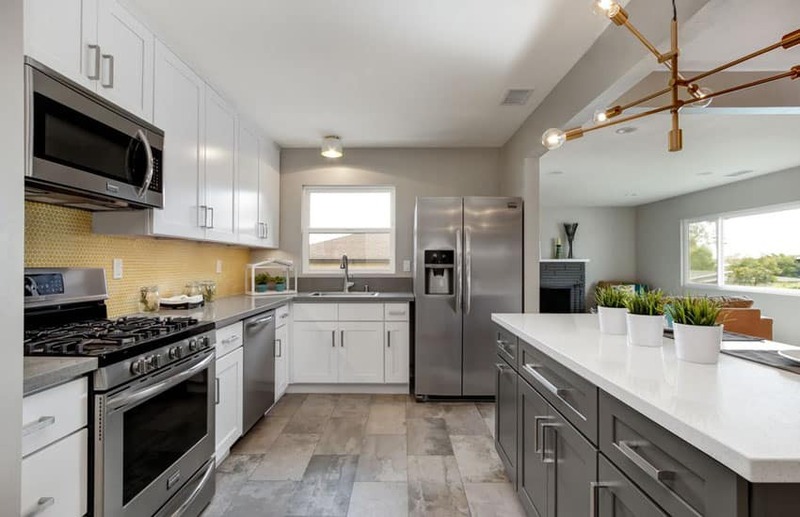 This contemporary kitchen has a very modern look with its combination of white kitchen cabinets and slate gray base for its massive kitchen island counter. 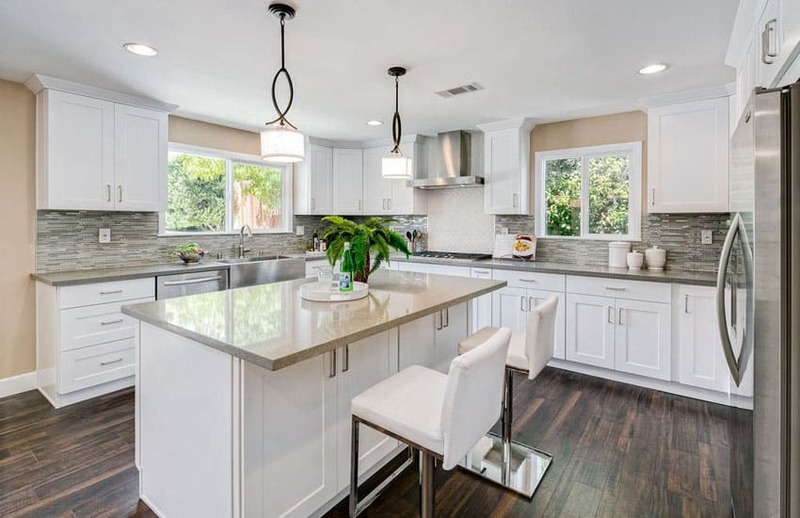 The white kitchen cabinets looks stunning against the soft yellow walls and the mahogany wood flooring, and by using gray and white mosaic tiles for the backsplash, brings more attention to the cooking area. The kitchen island on the other hand, looks like a separate piece of furniture, with its dark-colored base and smooth marble countertop, accentuated further with modern drop lights to enhance the ambiance. Going for an edgier looks, this kitchen combines rougher textures with smooth, modern finishes to achieve this look. Cabinets has a matte finish for a clean and fresh look that stands out against the light gray walls. The countertops on the other hand uses satin finish black solid surface for a seamless & modern look. The backsplash tiles are dark gray stone with a fine, rough texture, giving it a subtle industrial feel. This kitchen design features a great way to maximize windows, natural lighting and the outdoor landscaping, to create a bright and fresh ambiance into the interiors. Featuring a basic style of white cabinetry and light cream solid surface countertops, this kitchen’s focal point would be the windows placed right between the overhead cabinet and the countertop surface. Instead of a wall or backsplash, the area was converted to a narrow window, allowing not only natural lighting to pass-through, but to make the outdoor greeneries visible from the inside, making you feel like it’s part of the interiors. High ceiling, open floor layout and bright artificial lighting makes this kitchen look even more spacious. 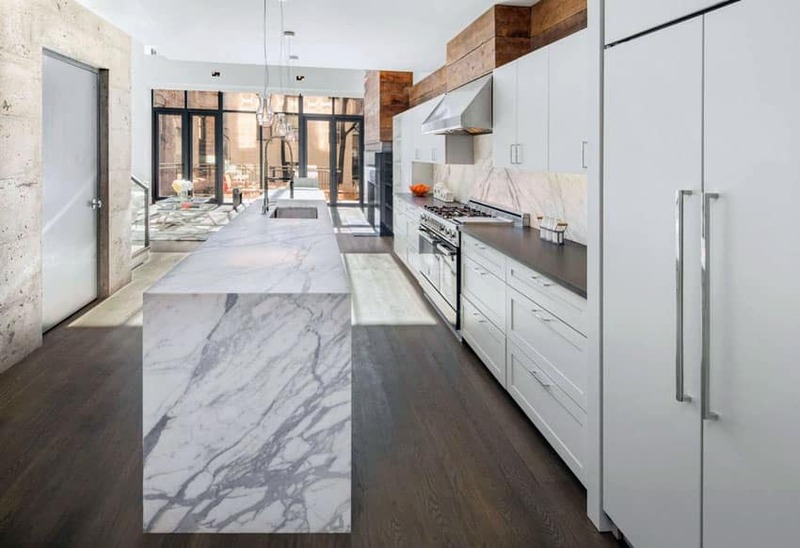 The design has a very modern contemporary look, using paneled modular cabinets, combined with the classic marble countertop with straight edging for a sleek look. It also features the use of mirror finish stainless steel, back-painted glass backsplash and undercabinet lighting for a really modern feel. The large floor area allowed the use of two massive kitchen islands, allowing efficient traffic flow & multiple users in the kitchen. Going for a country-rustic vibe, this contemporary kitchen adds in just the right combination of textures and colors to achieve the look, without going overboard with the variety of materials. 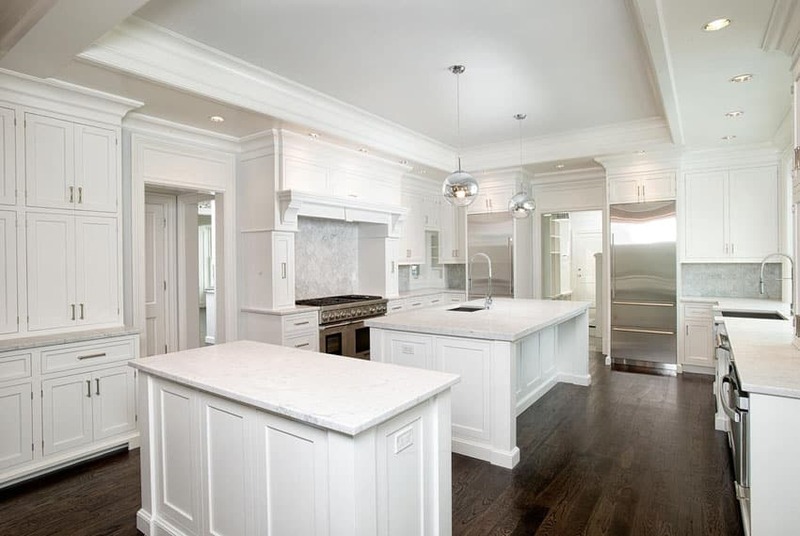 Kitchen cabinets are the basic all-white modular cabinets, topped with white carrara marble. The backsplash uses faux marble subway tiles for a subtle pattern on the surface, while the kitchen island uses black-laminated base instead of white. The barstools used has black metal legs and raw wooden seats, adding that rough, rustic texture to the design. The interior architecture of the space already features a gorgeous combination of materials and finishes such as horizontal wood planks, sandstone, terracotta bricks and dark oak flooring. 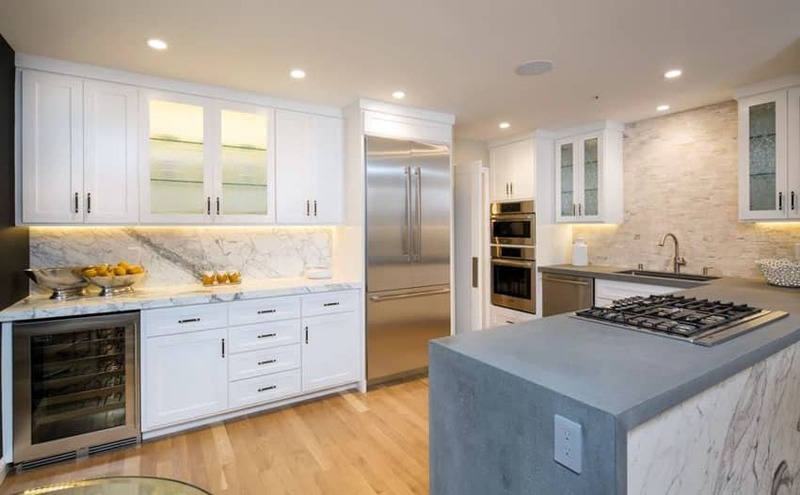 Because the interiors already features a variety of materials, the kitchen goes for a more clean, basic look, using matte white laminated cabinets, paired with satin finish quartz counters and marble kitchen island. This small contemporary kitchen looks stunning with its white cabinetry contrasted by black soapstone countertops. The upper cabinets offer glass doors giving them an added sense of style. The wood beam ceiling adds extra drama and elegance to the space. By combining soft tones of gray with white, this kitchen is able to achieve an light and somehow ethereal feel to it. High ceilings makes it feel airy and spacious. while the light finishes used creates a timelessly pleasing aesthetic. White modular cabinets were used of this design, and is topped with gray solid surface for a seamless countertop. This is paired with white glass and silver mosaic tiles, adding a touch of modern shine to the surface. The kitchen island on the other hand is considerably large and has enough space for both food preparation, and dining. Sloped ceiling not only gives height to the kitchen area, but adds a bit more movement and dynamics to the space. 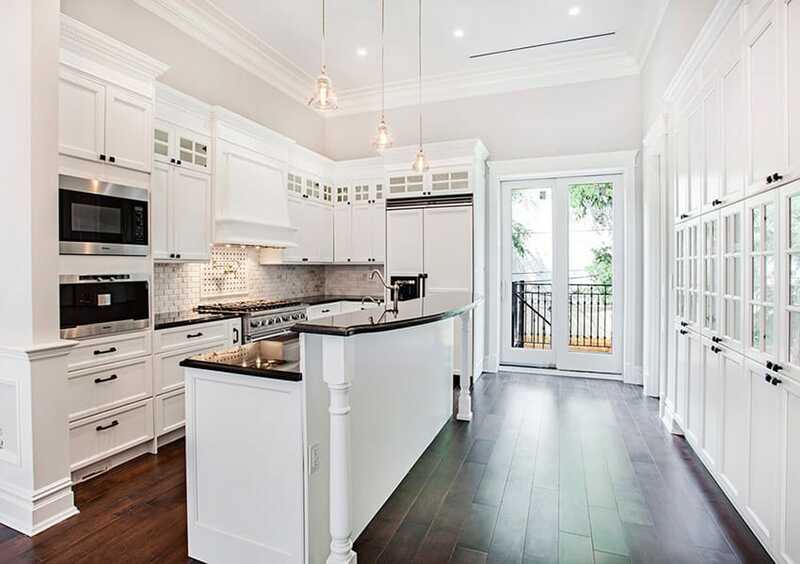 The white cabinetry stands out well against the mahogany floors and the taupe-colored walls. Its countertops are from white carrara marble with a straight edge and rounded corners for a softer look. To maintain the clean all-white look, white mosaic tiles were used for the backsplash, and is softened by warm white undercabinet lighting. For small spaces, this compact modular kitchen is a great idea, giving you plenty of storage and a sleek & modern look. The modular cabinet base has a metallic gray finish, while the overhead cabinets uses matte white laminates, creating a bold contrast of finishes. For the countertop, white solid surface was used and paired with plain white subway tiles for the backsplash. The dining table was placed right in the middle of the L-shape kitchen, allowing you to use the dining table surface for additional work surface when necessary. This kitchen features a great example of a contemporary style kitchen, combining classic silhouettes with modern finishes and fixtures to create a sleek yet elegant look. 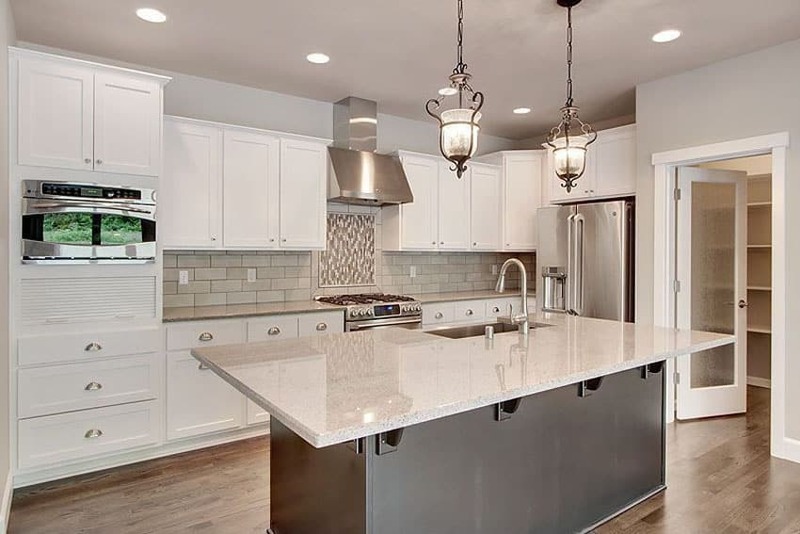 The main kitchen cabinets are all white and has gray quartz countertop, while the kitchen island has a gray base and white quartz countertop. This design also uses a unique yellow-gold mosaic tiles for its backsplash, helping add color and texture into the surface. 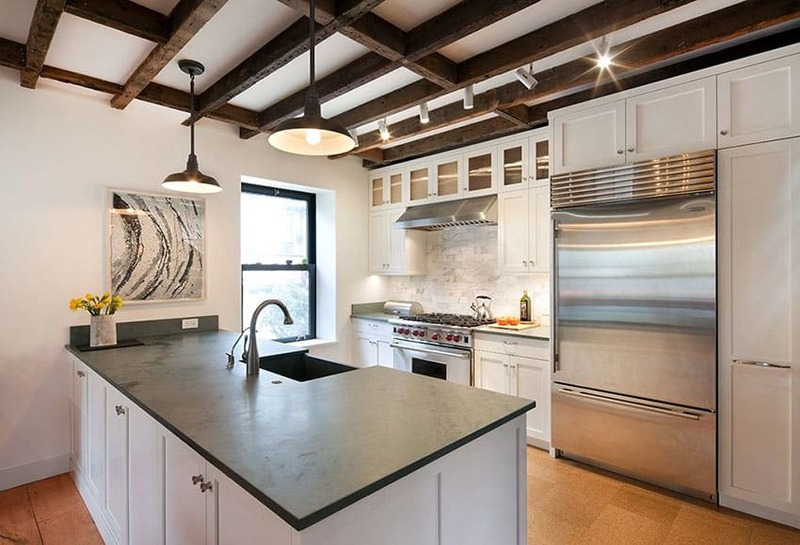 Going for a gray and white color scheme, this kitchen invokes a masculine and very modern vibe. 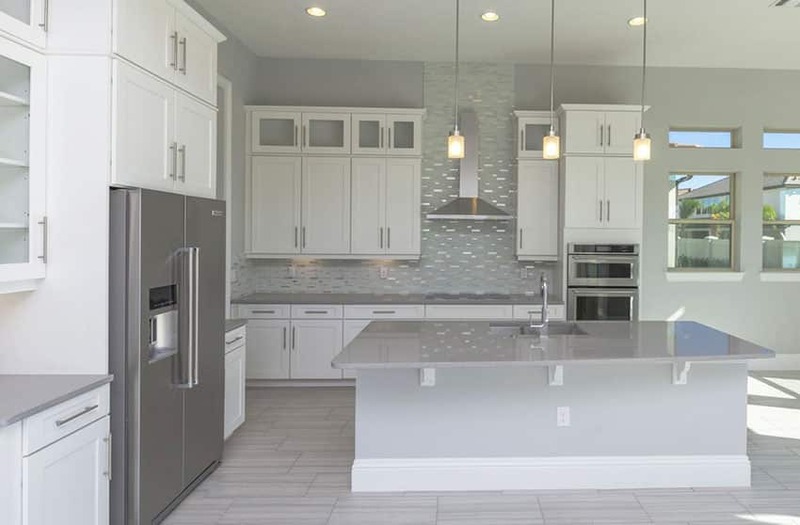 White modular kitchen cabinets were combined with dark gray quartz solid surface counters and gray & white glass backsplash tiles. Many white contemporary kitchen design choose quartz countertops for their beauty and durability. The almost black wooden floors adds a very subtle touch of warmth to the space, as well as the warm white under-cabinet lighting which helps soften the cool tones in the space.